April is the harbinger of Hindu new year in India. All over the country different communities usher in their new year according to the Hindu calendar this month. Bengalis are no exception. Our new year Poila Baishak comes in around the 15th of April each year. The commercial and the official world in India has long switched to the Western calendar but the Hindu calendar is kept going by communities. Marriages, birthdays and other personal festivities are in accordance to this calendar, so are the religious festivals. To celebrate this Poila Baishak I decided to share with you a very special recipe by a dear blogger friend. Mango pickle or as is known in Telegu~ Mamul Avakaya. Since this is the time when green mangoes flood the markets in India, pickling of these precious babies happens at a frantic pace. Pickling is a very important part of Indian cuisine, and Indians love pickling all kinds of fruits, vegetables, meat and fish using different varieties of spices. Each region has it's own pickling techniques and specific spices and variety of oil and each family their special pickling recipes. These recipes are generally generations old, which have been hoarded and fine tuned over decades. But before going into the recipe, let me first introduce my guest Amrita. I first stumbled upon Amrita's Instagram account drawn by her vibrant, colourful photos of everyday life in India. Before long, we got talking and I discovered she blogs at sensous2spiritual and has a thriving Facebook page. 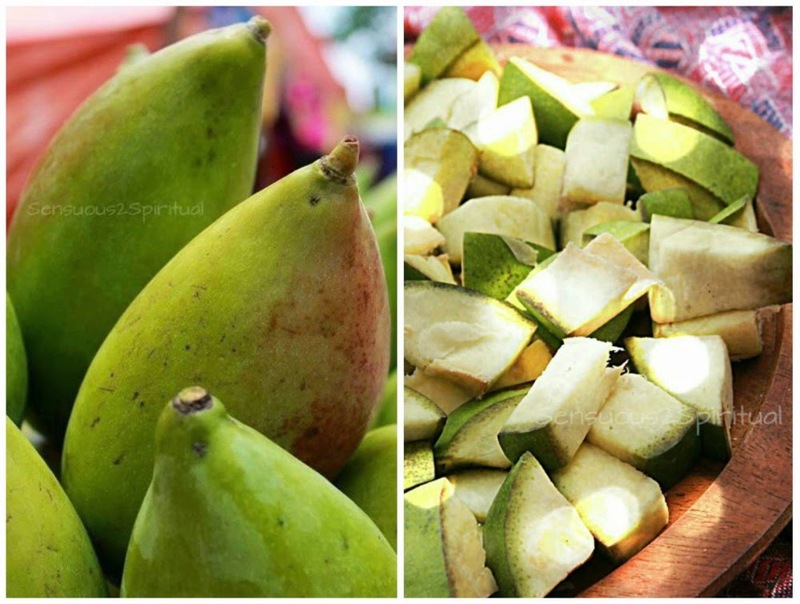 It was on her FB page that I discovered the photographs of mango pickling. Last year Amrita had documented the entire pickling process that her family goes through every spring when the raw mangoes are in season. It is a tradition in her in-laws family, one which she and her husband have proudly decided to carry on. Being a huge pickle fan I was fascinated by the photos. So this year I decided to rope Amrita in and make her share her story and photos and if possible, a recipe. I did not dare hope that she would agree to share the cherished pickle recipe, but the generous sweetheart that she is, she gladly did. Over to Amrita and her story. It is that time of the year again when the sour Rajapuri mangoes make an entry into our cosmopolitan yet traditional Gulti-Bong (aka- Telegu-Bengali) home. For the longest, the ritual of pickles was conducted at my in-laws home but last year we turned a leaf. 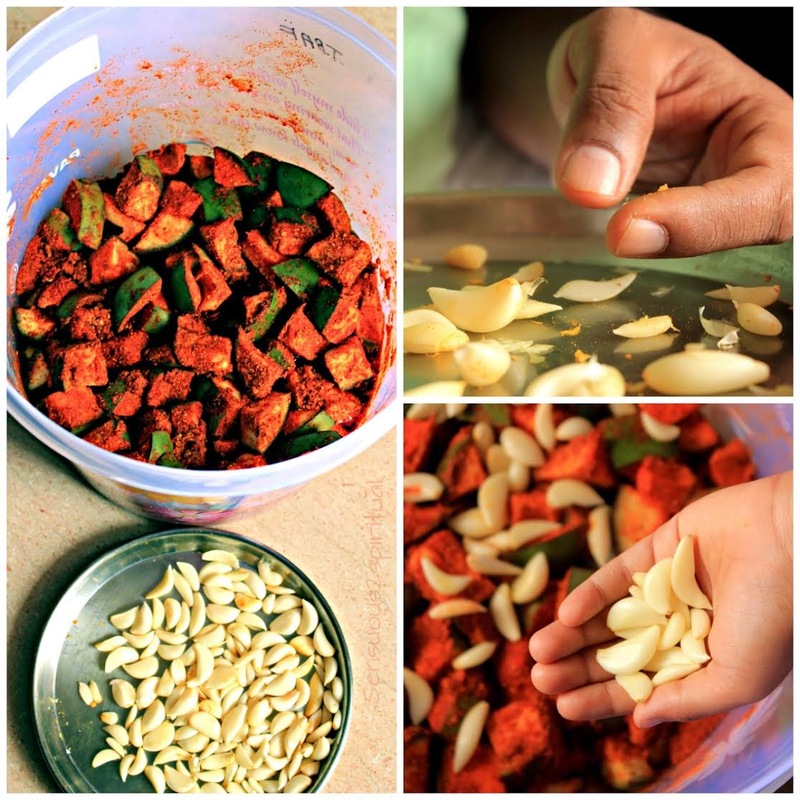 The family decided to make pickle at our home instead and pass on the age old tradition to us. My father in law holds the esteemed title of the 'CPO- Chief Pickle Officer' in our household. He trained under his mother from the age of 10 and since then there has been no stopping him! He has single-handedly dished out varieties of avakaya for over 60 years and getting a bottle of his pickle is considered as being gifted gold! Krishna's pickles were a popular feature at the Indian Airlines lunchroom where his colleagues of 36 years waited to smack their lips with this mouth-watering treat. Click here to view the visual journey of our Pickle making session from last year. We feasted on 3 yummy varieties of this well matured treat through the year and gifted many bottles to our near & dear ones. This is the traditional mango flavoured pickle. The type which can be had with almost all kinds of food and is THE ‘all-season’ variety. It is that must have bottle in any Andhra home. A variant of the mamul avakaya but the fragrance for this mix is largely garlic. 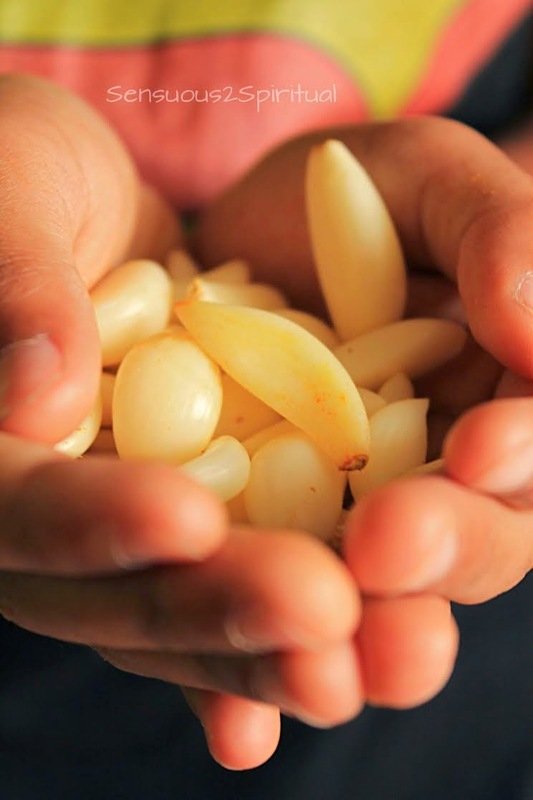 When marinated the garlic is a burst of sour from the mango followed by a warm after taste of the garlic. A perfect pickle for the curd rice on a cold rainy day. This avakaya has a sweet tinge. Goes perfectly well with the dosai’s and addai’s. The pickle has a tendency to be a slightly watery in consistency because of the use of bellap (jaggery). Just the perfect one for all those tiffin items of the Andhra Home! 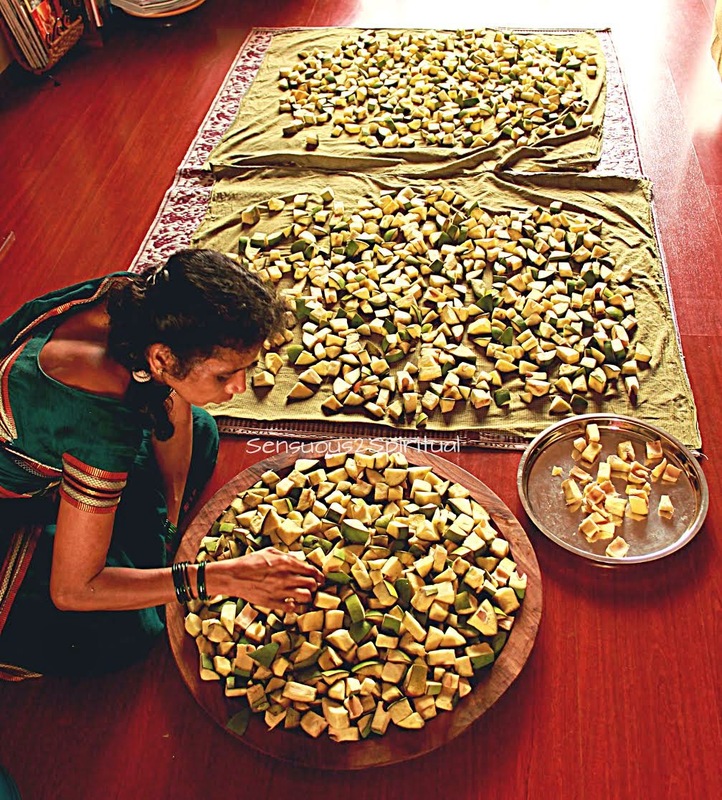 While we set out to mix this year’s tasty treats, here is a special post for Suchi (so honoured to be part of your magical journey) and her beautiful readers on making your lot of the traditional Mamul Avakaya! Typically the smaller varieties of the Rajapuri Mangoes are sour. The bigger sizes tend to be sweeter. If the mango is of the sweeter variety you will need to adjust the citric acid consistency. It is critical to use the sour mangoes for the avakaya. Idium Til Oil is a brand that is famous in our household. In case you don’t find this brand you need to buy the medium consistency til oil (seseme oil). Preparing this pickle is a 3 step process followed by a patient wait of minimum 20 days to a few months of religious airing of the concoction to aid the process of maturing the pickle. The more you expose the pickle to sun and air the more the taste. I religiously air this treat at least once in 2 months for duration of a few days under direct sun. You will see the colour and taste change over time. Hence the patience, respect and love! Clean the mangoes with a wet cloth followed by a dry cloth and then cut the mangoes in a 1inch x 1inch piece. If you happen to buy the mangoes pre-cut do follow the above process of cleaning thoroughly. Once the pieces are ready lay them out in the open to dry for a couple of hours at least. In case you are from a place where there is natural moisture in the air, like in Mumbai, allow for your mangoes to dry a couple of hours more. You will find that the mangoes look dryer once you’ve left them in the open. It is an important step since the mango needs to dry well else it will release a lot of water post mixing of the masalas. This can cause the pickle to spoil on a later day. Next, drop all the dry masalas- chilli powder, mustard powder, turmeric powder, salt and methi seeds into a clean dry container. Mix them together and please remember to tie a scarf over your nose else you may end up in a sneezing bout! Once the powder is mixed well add the pieces of mangoes stirring in with each batch and ensuring that you are mixing the fruit well with the masalas. Mid way through start adding the oil until all the masalas and oil are mixed up completely. Just before the last stir add the citric acid to the mix. Please wear a glove when you do this so that you don’t burn your skin with this little white crystal. 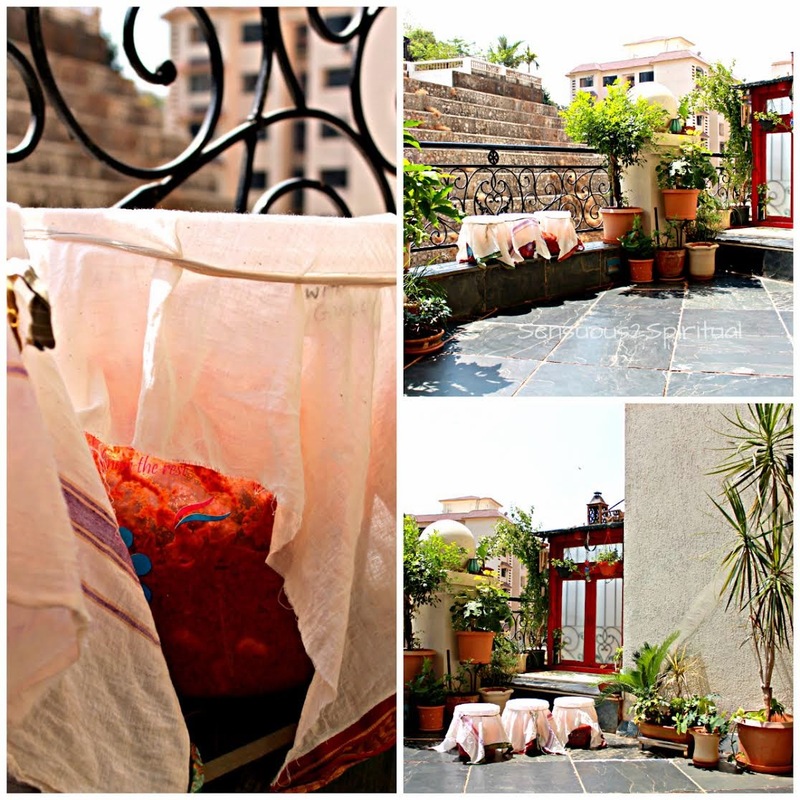 Now place a clean muslin cloth on the container and set it aside in a quiet warm corner of your home. You will not disturb this vessel for the next 3 days hence plan for the place where you wish to keep this container. Today is day-4 of this process. On this day, open the muslin cloth and give your ‘masala indulgence’ a love filled look. You will find the most passionate red stare back at you! With a clean long handle ladle give the pickle its first stir. Dig deep down into the container and bring up all the bottom pieces of mangoes. Keep stirring the mixture and enjoy that mouth-watering fragrance of your avakaya. Once you have given your pickle the stir of its life set the muslin back in place and seal the container yet again. Let the container out in the hot summer sun and bring this back into the house once the sun sets. Follow the Step-2 process every day for the next 15 days. This is the time when you need to not just stir but also sun your pickle religiously. The perks of this process is that you can taste the masala over the next few days and literally know the ‘GOLD’ you are making! Finally, looks like you are closer to your first batch of Sensuous2Spiritual Mamul Avakaya! You can gift your friends and family your very own family treasure. PS: If you wish, you can reduce the Red Chilli Powder to ½ the quantity but like the Andhra guys say: what is a pickle if you don’t sweat when you have it! Thank you for the beautiful feature Suchi. :) For the Kitchen Karma readers, it is worth a try. Make it once and then there is no looking back.